There are a number of reasons why the complex food distribution and energy infrastructure of a country could fail. It could be as a result of a natural disaster such as an earthquake, or something man made like a terrorist attack. Whatever the causes of a social breakdown, the resulting failure of the food supply will most likely result in panic buying, looting, and other forms of social disorder. In an ideal world we would have a well stocked survival retreat, with an alternative energy supply, food stores, and the means to defend ourselves. However, not everyone can afford such a retreat, and even those who have one may find themselves unable to return to it in time. Alternatively they may have their supplies requisitioned by government forces, or their retreat may be overwhelmed by looters. Supply Caches provide a basic life support system for those who are forced to retreat to areas of wilderness, or they can be strategically located en route to your main retreat location. A supply Cache should be well hidden or preferably buried at a remote location. 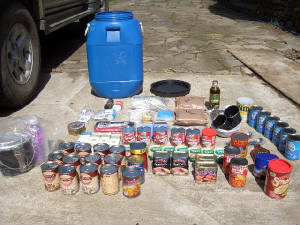 The following Food Cache is intended to supply at least 2 weeks worth of food for one person or 1 week’s food for 2 people. 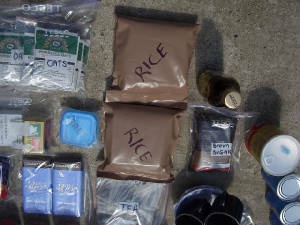 I will be covering other types of survival cache and their contents over the next few months. 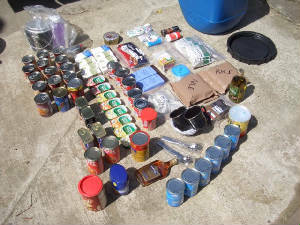 I will list the items I have included in my caches although you may wish to adapt the contents to your own preferences. 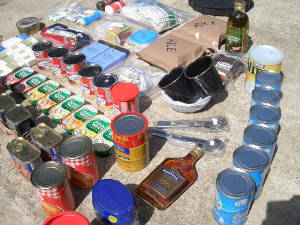 The main concern is that the cache contains as much food value as possible (2000 Calories + per day), as well as offering a balance of all the major food groups. I’ve opted to make up the majority of the supplies from canned goods for maximum shelf life. I would expect this cache to be edible for a minimum of 5 years. I have also included cooking equipment and items such as toothpaste and toothbrushes to maintain personal hygiene and hopefully prevent dental problems in the future. The following is a list of items I’ve included in some of my caches, but you may wish to add or remove items depending upon your own preferences. Military style Trangia (Methylated Spirit) Stove with 1 litre of fuel. The pot from this stove can also be suspended over a fire.